With Tanner off to college and Kevin only here a few weekends a month, Jim has become my primary cooking “audience.” As you may have noticed in previous posts, I spend a lot of time discussing what Jim likes to eat as the impetus for the foods I cook. My Paleo pork chili Colorado is no exception. I want Jim to enjoy the foods he eats so he is more easily able to stick to the plan. His health (and mine) is very important to me. Pre-heart attack and pre-Paleo diet Jim really liked to eat Chili Colorado at Mexican restaurants. One night about a month into the Paleo diet, he got a wistful look in his eyes and started talking about how much he missed Azteca’s chili Colorado burrito. Clearly a burrito was out of the question, but I figured I had chili Colorado within my reach. For my first attempt, I had some grass fed bison stew meat in the freezer, so I thought I’d try that. I nailed the spice blend, so the flavors were great, but the bison was just too dry to lend itself well to the slow stewing that happens with chili. This week, I decided to try some pastured pork shoulder instead. What a difference. 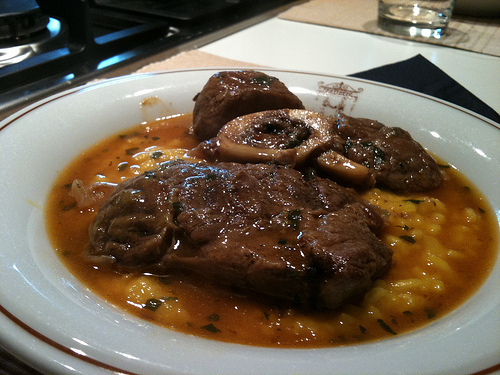 The fat in the pork added a richness of flavor, and the meat took on the spices nicely. So now, when Jim gets that wistful look in his eye, I’m ready for him with a nice pot of pork chili Colorado. Season the pork cubes with salt and pepper and put them in the slow cooker with the onions and garlic. 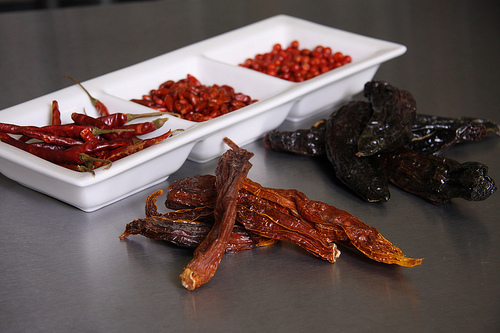 Roughly chop the dried chili peppers and put them in the bowl of a food processor. Run the processor for 20 one-second pulses. 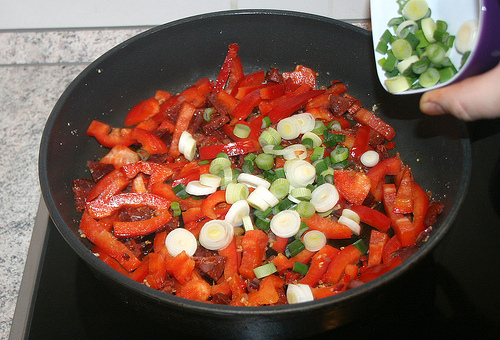 Then, run it continuously until the peppers are chopped into a powder with a few small pieces in it. Add the peppers to the slow cooker, and then add the cumin, oregano, onion powder, garlic powder, and stock. Stir to combine. Turn the slow cooker on low and cook for eight to ten hours. I love spicy food. Jim is a little more reticent. He will eat it, but he prefers it not be too hot. Most jambalaya recipes have a lot of heat in them, making them spicier than Jim’s palate prefers. So I set out to make jambalaya (without rice for obvious reasons) that would fit Jim’s heat preferences. This recipe turned out perfectly. It had a little heat from the andouille without setting fire to our mouths. If you like it spicier, add more cayenne. In a large slow cooker, combine the onion, peppers, jalapeño, garlic, andouille, chicken, tomatoes, broth, thyme, oregano, basil, salt, pepper, and cayenne. Cook, covered, in a slow cooker on low for seven hours. Stir in the shrimp and lemon juice. Cover and continue cooking, turning the slow cooker up to high, until shrimp is pink, about one hour. Serve garnished with the scallions. I tend to cook fairly seasonally. In the spring, summer, and early fall, I go to the local farmers market to pick out beautiful locally grown fruits, vegetables, and herbs and then plan my meals based on whatever I bring home. In the late fall, winter, and early spring our local farmers market closes, and I am left with what I can find in grocery store’s organic section or, occasionally, what I can pick up at the year-round farmers market in Olympia. Cooking in this way also follows my natural appetites. In the summer, my meals are lighter with fresher flavors and lots of greens. As summer fades, however, I tend to cook heartier foods with more warming, deeper flavors. I also cook lots of root vegetables, because that’s what is available. 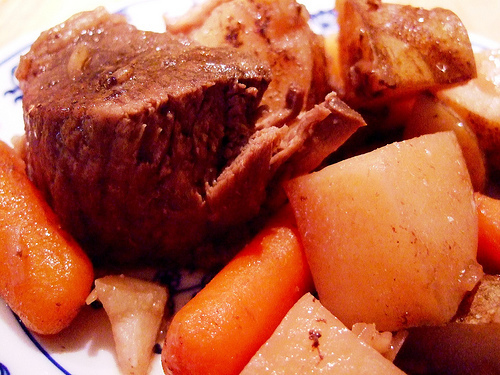 Pot roast is the quintessential fall/winter meal. It features an affordable and fatty cut of meat and flavorful root vegetables. Because the fatty cuts you use for pot roast perform best under low, slow, and moist cooking conditions, the slow cooker is the ideal vehicle for a tasty pot roast. I’m a big fan of browning meat and vegetables before putting them in the slow cooker. This just adds an extra depth of flavor. However, if you don’t feel like doing any browning, then just toss everything in the slow cooker raw. It will still be pretty darn tasty. In a large saute pan, heat two tablespoons of the fat over medium-high heat. Add the onions and cook, stirring occasionally, until they begin to brown, seven to eight minutes. Add the garlic and cook, stirring constantly, until it is fragrant, about 30 seconds more. Put the onions and garlic in the slow cooker and return the sauté pan to the heat. Add the remaining two tablespoons of fat. Season the chuck roast liberally with salt and pepper. Put it in the hot fat and cook it, searing it on all sides, four to five minutes per side. Put the chuck roast in the slow cooker with the onions. Return the sauté pan to the heat. Add the wine and stir, scraping any browned bits off the bottom of the pan with the side of a spoon. Add the beef stock and whisk in the garlic powder, onion powder, ground mustard seed, and freshly grated horseradish. Simmer for about three minutes to allow the flavors to blend. Put the baby carrots and celeriac in the slow cooker with the roast and onions. Pour the wine mixture over the top. Cover the slow cooker and cook on low until the meat is tender, eight to ten hours on low or four to five hours on high. Grate in the remaining one tablespoon of horseradish root just before serving. Optional: If you wish to turn the sauce into gravy, then ladle out the liquid from the slow cooker. 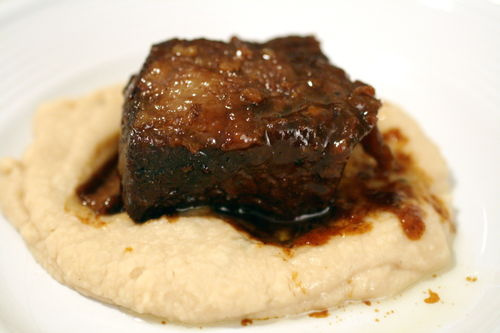 Put it in a saucepan and whisk in 1/4 cup of arrowroot powder mixed with 1/4 beef stock. This will add about 28 grams of carbs to the entire recipe, so if you are eating low-carb paleo, you may wish to skip this step. 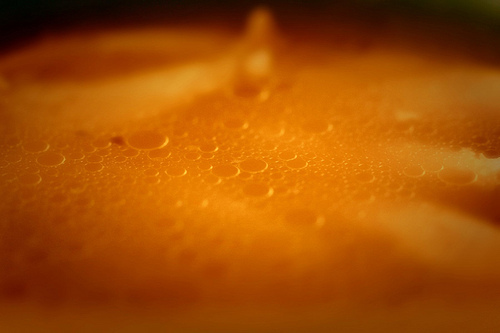 For low-carb paleo, simmer the liquid in a saucepan over medium-low heat until it reduces and thickens, about ten minutes. Recently, I bought some lovely ground pastured pork from a local farmer and knew I wanted to make something tasty with it. Okay – true – I always want to make something tasty. As always, I turned to my slow cooker. You may notice I’ve been posting a lot of slow cooker recipes lately. Here’s why. When you cook real food – that is, food that doesn’t come in packages, jars, and cans – it can be pretty time and labor intensive. Of course, the results are totally worth it, and I love to cook. But I’m cooking three real food meals every day – and I get tired of cleaning up the kitchen. Not the cooking – just the cleaning. Plus, Jim and I are often on different schedules, so we need to eat at different times. The slow cooker takes care of both of these problems. First, my slow cooker is 7 quarts, so I can make a lot of food in it. Therefore, I typically double any recipe I post here. It simmers all day long, and I’ve got meals for two nights, plus leftovers for the freezer. (Bonus: The house smells great!) My freezer is packed with yummy slow cooker food that I can take out and heat up for any meal. That means that I not only get two dinners out of one day of cooking, but I also have additional breakfasts and lunches on demand. It gives Jim the opportunity to grab a healthy meal for lunches at work, too, instead of having to turn to something like a fast food meal. The other reason I’ve been using the slow cooker so much is scheduling. When Jim and I are on our wildly divergent schedules, we can each eat a hot meals straight from the slow cooker when time permits. Slow cookers make it easy for busy families to grab a quick meal when they have the time. So, that’s why I love my slow cooker and use it so much. Oh – and one other reason, as well. The slow cooker is a closed system that cooks on low heat all day. This tenderizes meats and allows flavors to meld beautifully, so the meals are hearty and delicious. What could be better? 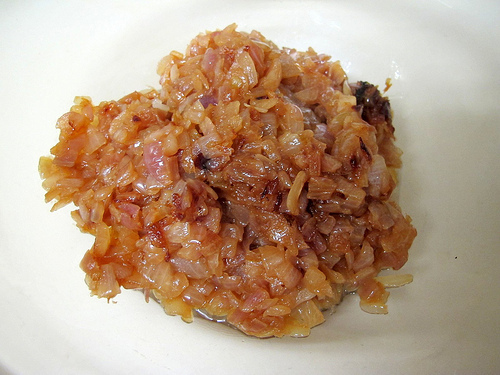 For the caramelized onions in this recipe, I make a huge batch in the slow cooker. You can also make a batch by cooking thinly sliced onions on the stovetop on low heat in a sauté pan with a few tablespoons of fat and a pinch of salt for about 45 minutes, stirring occasionally. In a large saute pan, heat the duck fat over medium-high heat until it shimmers. Add one of the onions and cook, stirring occasionally, until they are soft, about five minutes. Add the two cloves of the garlic and cook, stirring constantly, until it is fragrant, about 30 seconds more. Remove the onions from the heat and allow to cool completely. In a large bowl, combine the cooked onions and garlic, pork, 1/2 teaspoon of the mustard powder, spinach, 8 ounces of the mushrooms (finely chopped), the grated carrot, the dried thyme, the sea salt, the pepper, and the red pepper flakes. Using your hands, mix well to combine. Roll the mixture into meatballs that are slightly smaller than a golf ball. Put the meatballs in the bottom of the slow cooker. Add the remaining onion (chopped), the remaining garlic (minced), the chopped carrots, the remaining 8 ounces of mushrooms (sliced), the stock, the rosemary sprig, and some salt and pepper to taste. Cover and cook on low for six hours. Before serving, remove the lid of the slow cooker and allow it to simmer for about 30 minutes uncovered. Using a slotted spoon, remove the meatballs from the slow cooker and set them aside on a platter, tented with foil. Remove the rosemary sprig and discard it. Using the same spoon, remove the solids (the carrots, mushrooms, and onions) from the broth in the slow cooker. Put them in a food processor or blender with the caramelized onions and the remaining half teaspoon of dried mustard and process until they form a smooth puree. (Remember to protect your hand with a folded towel and to allow steam to escape through the open top chute of the processor). Pour the mixture from the food processor back into the slow cooker, using a rubber scraper to make sure you get it all. Whisk the mixture to combine the broth in the slow cooker with the pureed vegetables. 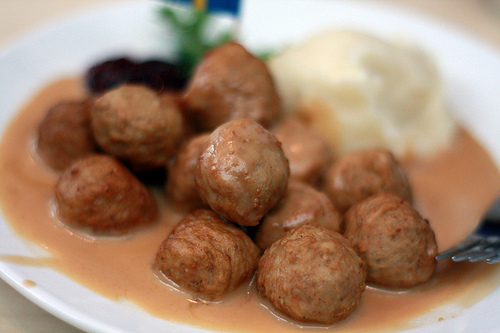 Return the meatballs to the slow cooker and stir to mix them with the gravy. Serve on pureed celeriac or cauliflower.